Woven Welcome, a community-based art project, utilizes the woven rug as a statement of the ways in which individuals are interconnected. In December, artist Jill Odegaard began making segments with a wide variety of groups throughout the Lehigh Valley. Odegaard and the Museum together with our community partner, Via of the Lehigh Valley—a nonprofit human service agency dedicated to helping children and adults with disabilities—continue to invite all members of the community to participate in Woven Welcome. Since 2010, I have had the opportunity to travel to polar and subpolar regions, including Antarctica, Iceland, Patagonia, and Greenland. I have captured large rock formations carved by eons of surf and wind, heroic and majestic icebergs floating to sea, smaller floating crystals resembling remote celestial bodies, giant natural mirrors, and abstract faceted-light-and-ice patterns. These scenes are often so exotic they may look manipulated, but the locations and subjects themselves are unique and otherworldly, removed from our usual experience. 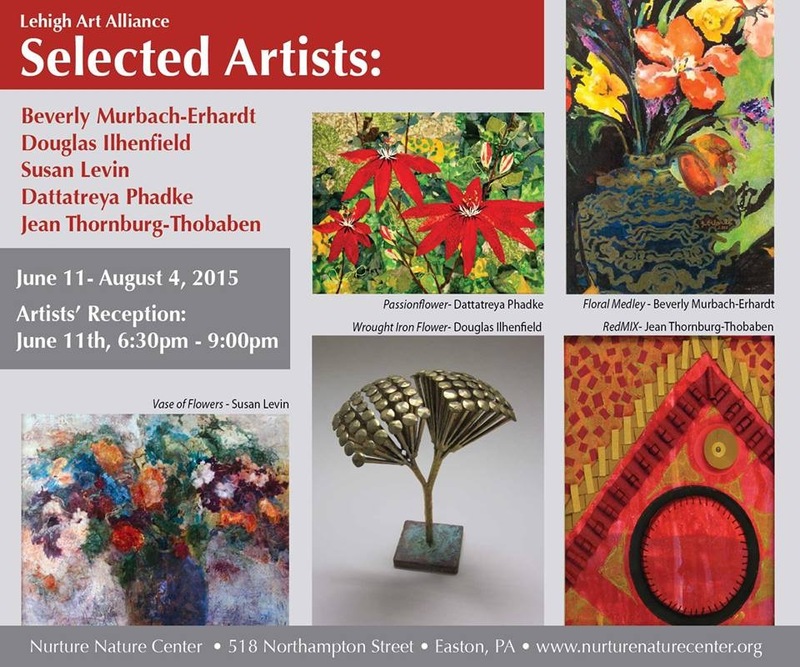 New work by local (Red Hill) artist Jean Thobaben is on exhibit at the Nurture Nature Center in Easton, open to the public on Saturdays and Wednesdays from 10:00am-1:00pm, and Thursdays from 6:00pm-9:00pm., 518 Northampton Street, Easton, PA.
Next Saturday is Art in the Park at Allentown’s West Park, 15th and 16th Streets, between Linden and Turner Streets, from 10 a.m. – 5 p.m. on June 20th (rain date is Saturday, June 27th). In addition to original works by over 100 artists, there is a new children’s art corner, and performances by Christerhun & Jomicho (Native American music), ASD City Strings, Repertory Dance Theatre, Allen High School Double String Quartet, the Allentown Band, Wyndham Baird (acoustic folk ballads, traditional blues) and Alana Amran & The Rough Gems. This year we invite you to share in the tradition of excellence at the tri-state’s largest outdoor, juried arts festival. Celebrating 26 years of presenting the best variety of fine arts and crafts from across the country, nearly 200,000 collectors, buyers, and designers will visit Main Street for this event. This year we have nearly 300 artists that will showcase their work along historic Main Street in Manayunk. If you are in the mood for music this weekend, head over to Allentown this weekend. The Municipal Band of Allentown is playing at West Park, 16th and Linden Streets, Allentown, beginning at 7:30 p.m. on Friday, June 12, 2015. Enjoy Blues, Brews and Barbecue in center city Allentown from 12 noon – 10 p.m. on Saturday, June 13, 2015; three stages with live music in the afternoon and early evening leading up to the headliner Joe Louis Walker, who takes the main stage at PPL Plaza at 8:30 p.m. This free festival has 24 food vendors, 2 beer tents, local artisans selling their work, and children’s activities. And don’t forget about our own Make Music Upper Perk on Sunday, June 21st free music performances all day and all night (8:30 a.m. – 10 p.m.) throughout the Upper Perkiomen Valley (9 stages!). This year we are featuring family fun music and activities, and opportunities to picnic while enjoying the music. Take the whole family out for the Children’s Film Series at Godfrey Daniels. This FREE event is open to everyone and anyone who wants to attend! The Children’s Film Series will be screened at Godfrey Daniels at 7 E 4th Street in Bethlehem, right in the heart of the SouthSide and the rest of the Film Festival festivities on Friday and Saturday, June 12th and 13th, as part of the SouthSide Film Festival. There are 4 different one hour blocks of short animated children’s films from all around the world. Mark your calendar for Saturday, July, 11th when Shakespeare’s The Tempest will be performed at the amphitheater at Green Lane Park. The free performance by the Commonwealth Classic Theatre Company begins at 7 p.m., (corner of Deep Creek Road and Synder Road, Green Lane, PA). This entry was posted in art shows, concerts, craft fairs, festivals, films, for children, local artists, local musicians, Make Music Upper Perk, theater. Bookmark the permalink.